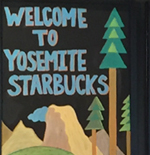 This info about enjoying a trip to Yosemite valley if you stay in a Half Dome Village (formerly Curry Village) wood floored, canvas sided/roofed tent cabin is especially for first-time visitors, but experienced people will probably pick up a few useful ideas. A lot of this webpage refers to winter trips, but since the tent cabins only offer heat part of the year and it can be cold, especially at night most of the year, this advice truly applies to visitors year round. The wood floored, canvas sided and roofed tentcabins are available heated or unheated. Models with heaters are usually available the Tuesday after Labor day through to the Friday before Memorial Day, but many people choose to save money by renting a tent cabin without a heater even in the winter with snow on the ground. 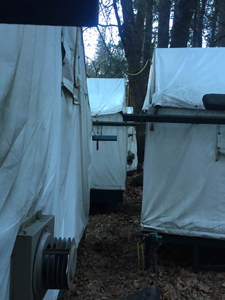 Below (photo courtesy of the NPS) are some of the canvas tent cabins and a bear that broke into one people left food in. 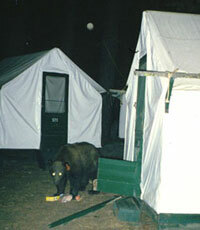 Always use the bearboxes provided at each tent cabin and campsite. See the end of this webpage for food storage, cell phone service and parking advice. 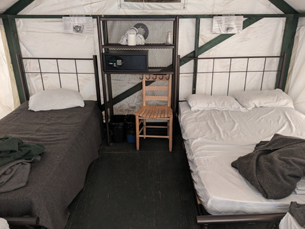 The tent cabins have various double bed and single bed combinations, electric lighting, restroom/showers nearby, lounge with free guest WiFi, but no phones/TV/fridge in the units. 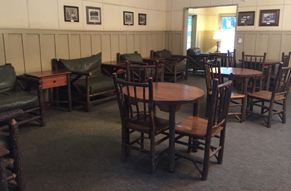 Below are Half Dome Village (Curry Village) canvas tent cabin interiors. Here is a link to a map at their website, of all the tent cabins / cabins without a bath (in white) and wood walled cabins with a bath (in orange) /shower house/restrooms/pool/restaurants and more. 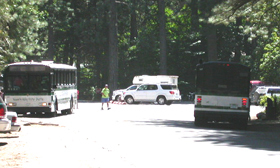 The Yosemite Valley free shuttle bus has many stops at Half Dome Village, most of which can be found on the map linked to above. When coming back from various other locations in the valley, Half Dome (Curry) Village canvas tent cabins numbered in the 1100s, 700s and 600s are closer to stop 15 on the Happy Isles Loop Road outside the cabins area (stop 15 is just off to the right on the map) than to the Half Dome (Curry) Village stops #14 and #20. Half Dome (Curry) Village canvas tent cabins numbered 1- 9 and all of the wood cabins (numbered with a letter after the number, such as 1D, 8A or 22B) are closer to stop 13B than to the Half Dome (Curry) Village stops #14 and #20. 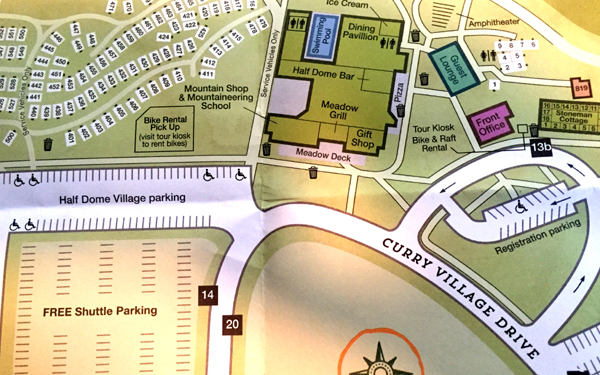 Notice which tent cabins are right next to restrooms for convenience in the weather but potential noise all night, or which are actually a longer walk to restrooms. 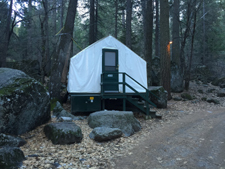 Some of the canvas tent cabins are heated and cost more. I was told that the unheated tents (with shared bathrooms/showers in the vicinity) are (on the map), 1-5, 466-482, 501-578, 601-691 & 701-752, and that the heated tents (with shared bathrooms/showers in the vicinity) are 6-9, 401-465, 214-299, 301-345. All the canvas tent cabins have bearboxes (food storage lockers). 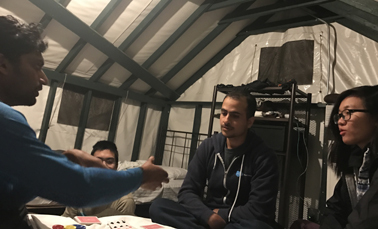 The Half Dome village website did not mention that the heated tent cabins have electric outlets. I was told that yes, they do, but you have to unplug the heater fan to use the electric plug to, for example, charge your cell phone. But those huge rocks are a part of the rockfall zone that runs all around Yosemite Valley. Not to mention you will have a longer walk with your luggage. Whenever you park in an area you are not familiar with, take a photo on your smart-enough phone, standing a bit away from where you parked, so you can find your vehicle. You could bring pages from an old calendar with pictures you like to put up over the rules lists on the tent wall so you don’t have to find yourself reading the rules again and again. Or maybe just hang a t-shirt with a logo you like over the you-should-not-remove-these rules mini-posters. The cabins are not carpeted. An old towel or two to spread on the floor or a small rug could make putting your feet on the floor when you wake up more comfortable. Take the hair brush or comb and mirror out of the toiletries / shower kit and leave your shower kit in the bear box, not the tent or the car. The mint toothpaste and Caribbean sunscreen really smell like food to the animals. There are no street lights and your cell phone will not function as a flashlight long enough or bright enough after dark, so you must have a flashlight (electric torch) and/or head lamp. See advice on choosing one. If you decide to bring a lantern, your lantern mantle may have disintegrated during transport to the park. It’s easier to put on a lantern mantle in the daylight. At least find your lantern and flashlight before it gets dark. When you take off your gloves/mittens to do work, stuff them inside your jacket to stay warm instead of putting them down in the snow. If it has been snowing you can tap your feet together or against a stair outside of the tent cabin to knock at least some the snow off your boots as you walk into the cabin. If your jacket is wet, wipe excess moisture off your jacket and put it in a plastic bag, folded so the wet places don’t touch the dry surfaces. Loosen the laces on your boots and put them in another bag. Take out down bags and fluff them up preferably at least a half hour before bedtime. Be certain down bags, vests, jackets, etc. never get wet –wet down is useless. Is your inner layer of clothes really sweaty? If so, put a dry set in your sleeping bag to change into, especially socks. If it has been raining you will also want a cloth to wipe moisture off rain jackets, and maybe a brand new sponge with no scent to it or one of those small super-towels that soak up a lot of water to mop up water (rain… melted snow you tracked in on your boots) from the tent floor. If you have no heat and it could be freezing temps overnight, the bag with your boots should go under the foot end of your sleeping bag or in the foot end if it fits, to keep your boots from freezing. Any removable insoles could go into the sleeping bag. At bedtime, if your jacket is dry, you can spread it out on top of your sleeping bag, with the inside of the jacket facing down towards the bag, to keep it from getting so cold, but don’t spread wet things over your bag. Why would this work? The thing that makes a sleeping bag warm is you. Your body heat warms the clothes you are wearing, the sleeping bag liner or an inner blanket, the sleeping bag, and a little might go out of the bag into a jacket on top of it. There are limits to how much dispersed warmth can do, though. Wrap a knit scarf around your face to pre-warm air by breathing through it. Resist burying your face in your sleeping bag because your moist breath will soak that part of the bag. Leave your knit hat on to make a HUGE difference in how warm you stay. You might also want a bandanna on under the hat to be sure your ears stay warm. If you’re using a sleeping bag without a hood, and with a wide opening at the shoulders, bring an extra blanket to wrap around the opening, so the bag won’t be drafty. Another blanket inside of a wide, non-mummy shaped bag will also be warmer. Again, the tent cabins offer rentals of sleeping bags, but do not have enough for everyone, so you would want to bring your own. Don’t wear too many clothes to bed. You’ll be warmer if you wear fewer, looser clothes. Tightness around your armpits or the tops of your legs can slow down blood flow. Plus, you’ll sleep better if you can move easily in your sleeping bag. Piling on lots of layers and a jacket and stuffing yourself into your sleeping bag really won’t work. Store your flashlight and your contact lens kit (in screw top containers instead of pop-open-any-time containers) in the sleeping bag to stay warm. If you will need a mirror to put in the contacts store it in or near the sleeping bag so you don’t have to go hunting for it in the morning. If you have a thermos that has never had anything but hot water in it (and therefore didn’t pick up any food odors) you could fill it with warm water for overnight drinking. If you don’t have a thermos for your in-the-tent overnight water supply, wrap your water bottle (a water bottle that also never had anything but water in it!) in a sock for extra insulation, and set it on its side or upside down. If you leave it sitting right side up, the thin layer of ice that forms in it on top of the water will keep you from drinking, and/or the moisture around the threads will freeze and you won’t be able to open it. Before getting up in the morning or at night, do some isometric exercises (do crunches, wiggle around and stretch in your sleeping bag) to get blood moving and warm your muscles. 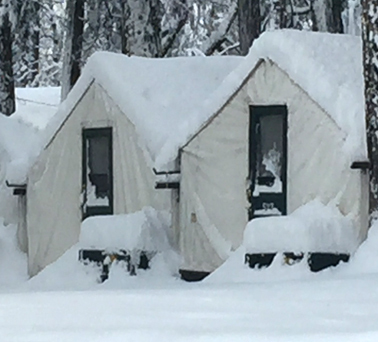 If you decide on a tent cabin with no heater, you might also want to have a clean rag or dishtowel in the tent to wipe moisture off the inside of the tent walls. This way, you won’t get up and bump the tent and make it drip or ‘rain’ on you (or snow on you, depending on how cold it was). But also have a spare blanket over your bags for the possibility. If you’ve been drinking enough water to stay healthy and be hydrated for the next day’s activities, you will need to get up in the middle of the night. If it isn’t cloudy, take a minute to check out the stars. It’s going to be cold in the morning and hard to drag yourself out of that warm sleeping bag. But you’ll probably want to get an early start. Did you remember to pack a battery operated alarm clock? The tent cabins do not come with a clock. You don’t want to miss the free bus to Badger ski area (snowboarding, cross country and downhill lessons and/or equipment rentals, the ranger snowshoe walk). You’ll want enough time to do a long hike before dark. – – – Those for sale in the park have in recent years cost twice as much as those we bought at home. When it’s time to put in your contact lenses, do it while still in your bag. Sit up and lean over the top of the bag. Spread the bag material at your lap out smoothly with a depression in the middle. Then if you drop the lens it will fall on the surface of the bag and head towards the center where you will be much more able to find it than on the tent floor, the ground outside or the muddy bathroom floor. Same instructions for putting new batteries in hearing aids. If your car lock is frozen in the morning, hold a lit match to your car key to heat it a little (watch out for your fingers and meltable polypro glove liners! And if it has a security code device in the key, or a plastic key fob, don’t try this). OR set it next to one of those chemical hand warmer packets in your jacket pocket. Gently pushing down on the trunk lid or against a door a few times may break up ice crystals so it will open. Also try de-icer in the locks. Don’t try breathing your hot breath into the lock, the moisture in your breath will just refreeze. Sometimes you just have to wait until it warms up a little, or have everyone climb in the one door that will open. If you didn’t pack enough proper gear to stay warm overnight, and you decide to try sitting in the car to warm up, with the engine running in the middle of the night, not only will you risk waking up everyone in the nearby vicinity, you could make it difficult or nearly impossible to start the car later when you want to go home. Prepare for winter driving has the reason why, a link to bad weather driving tips, tips for using tire chains, tricks for dealing with frozen car locks, how to prepare your vehicle for winter driving, a winter survival kit for your car, what to do if you get stranded, how to keep windows from fogging up and tips for driving in snow and ice. ! ! ! ! Tent walls are thin. You can wake up everybody in the vicinity ! ! ! ! when you want to get into your car and you use the keyless (remote) door opener and the car makes the usual loud beep. People don’t think to just use the key to open the door or don’t know that if you look in the owner’s manual you can find a way to disable the beep. 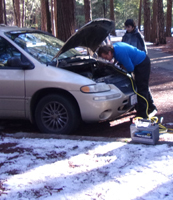 On De Anza Outdoor Club trips you are required to either disable the beep or not use the remote (remove it from your key chain during the trip) or park at the very back of the parking lot. Some vehicles have a beep activated whenever you open the trunk, that can’t be easily disabled. Every time the trunk is opened it beeps and it will wake up people. If your vehicle has this function, either look in the owner’s manual for info on how to disable the beep or take it to the dealer and get it done, or do not park it near tent cabins. The last morning it could be wise to try to start your car before you even start packing up the tent cabin, and warm it up for at least 5 minutes. Then if it won’t start you have more time to deal with it, instead of being all packed up and then finding out your car won’t start. You will want deicer for your car windshield, windshield washer nozzles and door locks. A real windshield ice scraper works better than a fabricated one. They recommend “ear plugs for additional sleeping support,” and a padlock for your food locker. Valuables should be stored in the mini-safe in the tent cabin, not in the food locker. On the map below note the office you will check in at, the pink almost-square labeled “Front Office“, the registration parking with a time limit and the free Yosemite Valley shuttle bus stops 13b, 14 and 20. Below is a picture of free shuttle bus stop number 14 on the left and stop number 20 on the right. 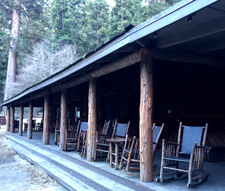 There are no TVs, phones or refrigerators at the Half Dome Village tent cabins, cabins with a bath or at Stoneman Cottage. Free Wi-Fi for people staying at Half Dome Village is not in any individual overnight accommodation, only in the Guest Lounge which has lots of tables, chairs, desks and a fireplace in season (see the teal colored rectangle in the map above). Guests at Half Dome Village and people who are not guests at Half Dome Village can book a tour, pay to rent a bike or a raft (in warm months), or pay for winter ice rink use/ skate rental at the little Tour Kiosk between the front office and Stoneman Cottage near shuttle bus stop 13b. The warm months Bike Rental Pick Up area is to the west of the stores and food, north of the parking lot. This photo of bike rentals pick-up area is taken from the direction of the Half Dome Village (formerly Curry Village) guest parking lot. The main shower house has blow dryers mounted on the walls, but you might want your own hair dryer. See also: Swimming in Yosemite National Park. There is a small grocery store/gift shop. The park service has “healthy food standards,” including that each “front country” restaurant includes lowfat and fat-free dairy, beverages with no added sugars, low sodium, whole grain, vegetarian food items. Seafood needs to be from “managed, sustainable, healthy” fisheries. Coffee should be Fair Trade. Offerings at the Yosemite Lodge dining establishments at free shuttle bus stop #7 have more variety than at Half Dome Village, especially in the winter. The Coffee Corner is now a Starbucks with the usual beverages / snacks. The main grocery at free shuttle bus stop #2 has premade individual meal-type salads with dressing packets, and whole or half grilled chickens, plus lots of sliced cheese/meats, crackers/breads, cookies to pack an impromptu dinner from. You can eat out at the cafeteria, but some people try at least one dinner in a campsite someone may rent or at a picnic area. Snow or rain camp must-haves has menu ideas along with the details about gear and any boots/jacket/sleeping bag rentals we know of. 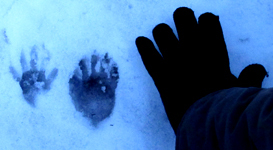 Some winters a few Yosemite valley bears never go into their winter dens, but stay active and looking for food all winter. 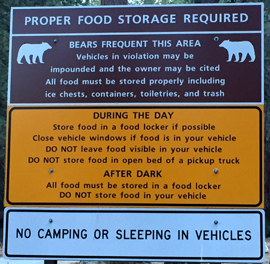 Bears in Yosemite break into vehicles and tents that have food or toiletries in them. Raccoons take advantage of people who leave doors and trunk lids open or leave gear unguarded in a truck bed while people unload their vehicles. When camping with a large group of people we have found that some complain there is not enough room in their shared bear box for all their gear. Advice on how to use the space more effectively is at Using a campsite food storage locker which also has this advice and more: Bears break into vehicles (including car trunks), tent-trailers or tents to get at food or even containers shaped like food seen through the windows, so campers need to put all food, ice chests, toiletries, stoves with spilled food, water bottles that had are now empty but had lemonade mixed in them, trash that didn’t quite get to the bear-proof dumpster, pans and dishes in the bear box. You can’t trust your own nose; look around the car, including under the seats, and in the glove compartment, thoroughly. Hey, no scented air fresheners hanging from the rear-view mirror! Puuuuuulease get rid of the dashboard hula girl that emits the pina colada scent, (only $2.99 at the Frys one day Flash Sale and you couldn’t resist) and everything else scented from your vehicle so the bears won’t be tempted to break in. Stop stuffing the ashtray with gum wrappers. Dig the old french fries out from under the seats. 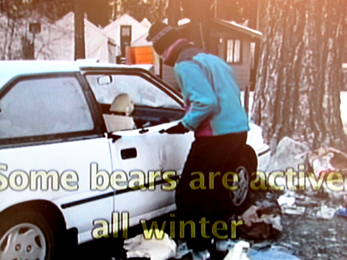 No water bottle, bottle of brake fluid or spray can of deicer showing, the bears don’t know it’s not food and will break into your car because they see an item the shape of a food container. 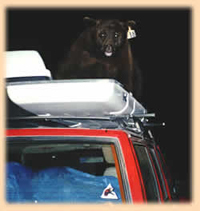 A daypack / backpack is also a food container to a bear, so you should not leave even an empty pack visible in the car. The best policy is to leave your car cleaned out of gear visible through the windows. Air out your vehicle if you eat burgers/pizza on the way to the park. 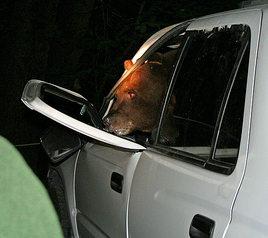 Setting your car alarm will not keep bears from getting into your car, but it can wake up everyone in the vicinity. The resident Ravens will take any food you leave unattended on a picnic table. 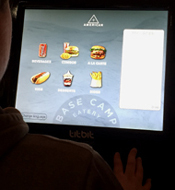 Keeping food within arm’s reach is a wise idea at each of the hotels and campgrounds. The park warns: “If your food is stored improperly, you will be cited for improper food storage (fine of up to $5,000).” See also an index to over a dozen park webpages with park laws, rules, regulations and policies. Cell phone service is not available all over Yosemite valley, but is usually okay in the vicinity of the main visitor center. Half Dome Village cabins with a bath there are some UN-assigned parking spaces near or next to most buildings. A few of the Half Dome Village tent-cabins and most of the cabins with a private bath are very near potential parking spaces, but parking spaces might be occupied by someone else when you arrive. 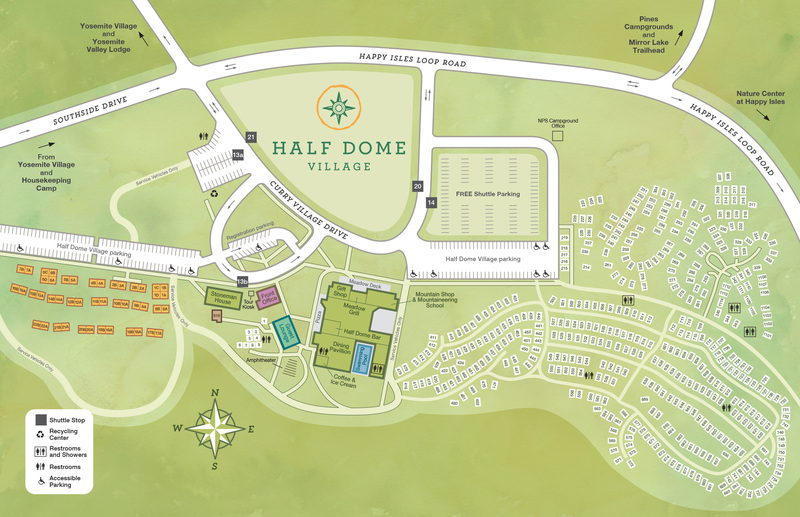 Here is a link to a map at their website, of all the tent cabins / cabins without a bath (in white) and wood walled cabins with a bath (in orange) /shower house/restrooms/pool/restaurants and more. Please note that the registration parking is very short term and they can tow you. The Yosemite National Park entrance fee, effective June 2018, will be $35 per vehicle or $20 per motorcycle. An annual park pass will cost $70. Safe driving in rain and fog includes info about driving in fog, on black ice, driving in rain, driving in floods (don’t) and chain requirements, with lots of links to follow. 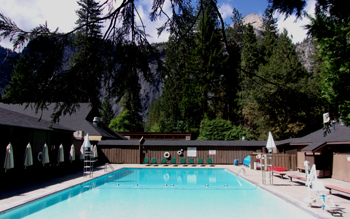 Logistics of getting from the campground, Half Dome Village or Yosemite Lodge in interesting weather to the Sunday brunch most people on our trips go to are at the end of the page at Ahwahnee Hotel Brunch. How do I convince my parent(s)/guardian that I can go on this trip? or How do I convince them to pay for some gear for the trip? Snow or rain camp must-haves We put info about lots of potential gear rentals and budget minded clothes ideas there. Snow Camp is the main trip page. 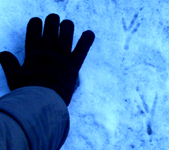 There are still birds in Yosemite in winter. Some of us refer to the Raven calls near sunrise as the Raven alarm clock.